Get thrifty dinner recipes you can make any night of the week in your slow cooker with our printable collection, Cooking on a Budget: 12 Slow Cooker Budget Dinner Recipes free eCookbook. In our free eCookbook filled with budget slow cooker recipes, you'll find a variety of inexpensive slow cooker recipes to try for weeknight meals, entertaining, and snacks. Included, are budget appetizer recipes, budget dinner recipes, and sweet budget dessert recipes. If you're cooking on a budget, it doesn't mean you have to skimp on taste. Our budget slow cooker recipes prove that cheap eat recipes can be flavorful, easy and inexpensive. Our free eCookbook, packed with low-cost slow cooker recipes, includes thrifty dinner recipes for every season and mood. By downloading our free eCookbook, you'll have access to delicious recipes you can make no matter your budget. The budget appetizer recipes found inside this eBook are great all year round. These cheap and easy appetizer recipes, soups and more are surprisingly easy to make, and they're wonderfully inexpensive. 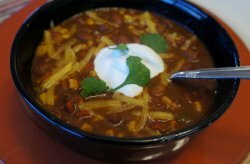 You'll love our selection of slow cooker chili recipes, including this recipe for Dollar Store Kickin' Chili (shown left). If you're not starving, but still want a meal that's flavorful and that will satisfy, this chapter of budget meals is perfect for you. Our chapter on budget dinner recipes has a tasty variety of slow cooker main dishes that are as creative as they are frugal. Whether you're interested in budget chicken recipes, casserole recipes, pasta recipes, or even ground beef recipes, this chapter includes them all. Our budget dinner recipes come from various influences, including Italian, Mexican, and more. You'll love our selection of budget chicken recipes, including our delightful Dump and Go Cheesy Chicken (shown left). It's simple to prepare and tastes delicious. What else could you want in a thrifty meal? Our budget dessert recipes chapter has a fun variety slow cooker dessert recipes to try, that won't cost a lot to make. 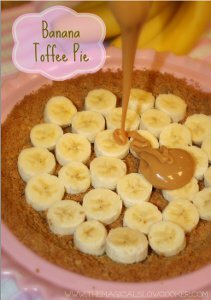 For instance, readers go wild for our Slow Cooker Banana Toffee Pie (shown left), which serves 6, and includes simple, cheap ingredients such as graham crackers and sweetened condensed milk. There are a variety of other deliciously cheap ways to prepare dessert in your slow cooker inside this free eBook, such as a slow cooker version of rice krispie treats, and tasty apple dumplings. Once you get your copy, you can keep it on your computer or tablet or print it out and keep it in your kitchen. No matter how you use your eCookbook, once you've tried even one of the recipes, you'll be glad you downloaded it. 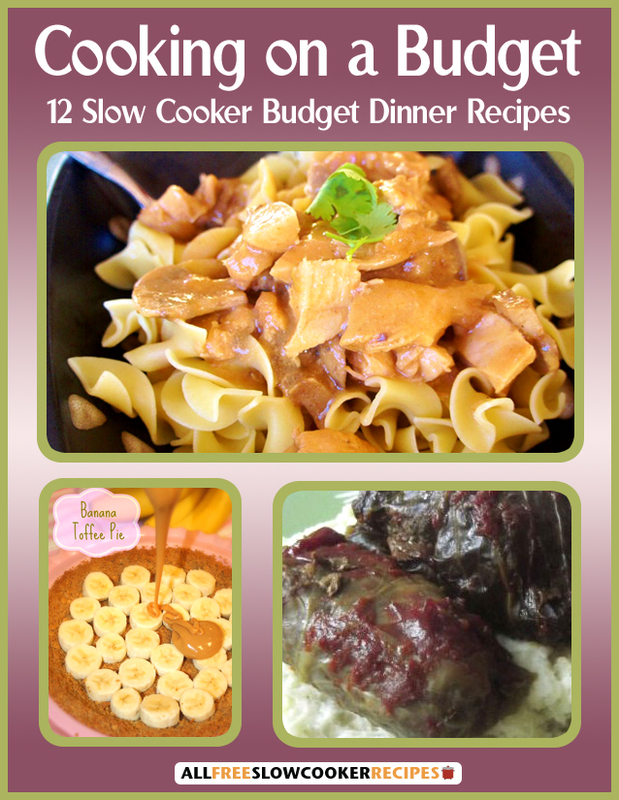 Download your free copy of the Cooking on a Budget: 12 Slow Cooker Budget Dinner Recipes eCookbook today! I will tell you my problem with making crisped rice treats. I cannot handle the stickiness of that marshmallow fluff sticking to the spoon as I try to stir everything together. It is the very reason why I never make this delicious and cheap treat. However, now that I know how to do it in the slow cooker, I am on board! The mini marshmallows melt on their own with the cereal bits, and with no chance of burning. Thank you for this cooking tip! Well, quite an original take on the apple dumplings. It uses a can of Mountain Dew soda! I think that the apple slice (or two) that is put inside the crescent roll dough should also have a coating of the brown sugar and spice, to provide a nice taste to the apple itself. I've been trying to live on a tighter budget lately, so this collection is perfect for me! THANK YOU!